800 watts of power-1.1 HP! Get all your favorite juices from one compact design with the all-in-one juicing versatility of an automatic juice extractor and citrus juicer combined! With 800 watts of power plus high/low speed control, you have all the power you need to juice all your fruits and vegetables with ease—even harder produce like rind-on pineapple and ginger. 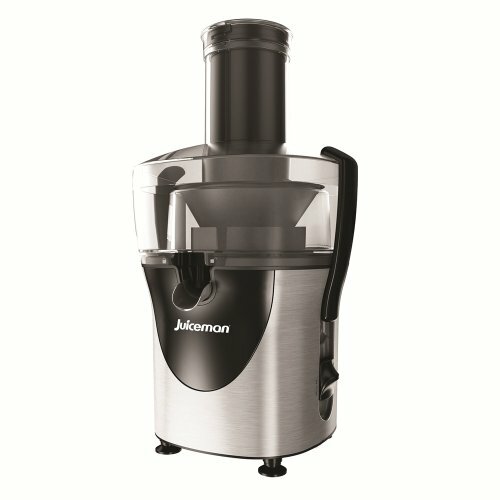 The 3” wide mouth feed chute lets you juice more with less precutting, while the extra-large integrated pulp container lets you juice more at once and then minimize your cleanup For the citrus juicer attachment, you can juice small and large citrus fruits with the 2 juicing cones with an automatic juicing action that does the work for you. All this, plus a snap-up juice spout to help keep drips and spills off counters, plus a custom juice pitcher that makes measuring, pouring and serving a snap. All parts are dishwasher-safe for easy cleanup.